A new sodium-ion battery chemistry that shows superior performance to existing state-of-the-art sodium-based batteries could be the catalyst to enabling mass-production of the emerging technology for large-scale energy storage, such as in applications including storing solar power for industrial sites. Despite sodium's appeal as a low-cost, abundant and environmentally friendly building block for energy storage, it is a relatively new entrant in the field of battery technology research and development. A key issue for sodium-ion batteries is that many of the active materials used in their chemistry are sensitive to air—exposure to even a few molecules of air can degrade the material and reduce battery performance. Tackling both the material performance and the industrial feasibility issues, researchers at the University of Wollongong (UOW) Institute for Superconducting and Electronic Materials (ISEM) have successfully developed a material based on transition metals that is not sensitive to air and can therefore be mass produced much more easily. 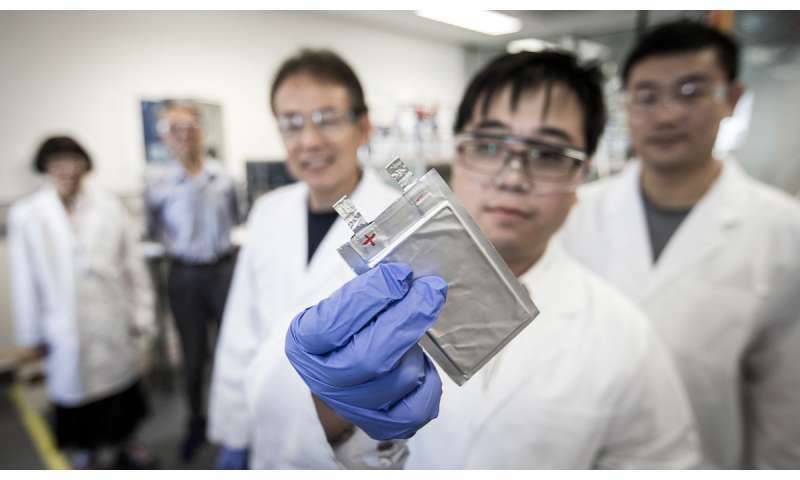 "One of the ongoing issues for batteries is cycle life, or how many times it can charge and discharge effectively," lead researcher Dr. Wenbin Luo said. "We were able to build upon previous research to manufacture proof-of-concept battery cells to show the performance of this material, and it showed fantastic energy density and cycle life. "In addition, we developed the processes to cheaply and easily manufacture this material, which is a big part of making it attractive for commercialisation." "With new materials and processing techniques we can focus on further development that will pave the way for the transition to commercialisation of this exciting and much-needed alternative to lithium-ion batteries." This material, reported recently in the journal Advanced Energy Materials, was developed as a collaboration between researchers from ISEM and Guilin University of Electronic Technology in China and provides a major step forward in the development of sodium-ion batteries for practical applications. Sodium-ion battery development is a hotly contested research area in energy materials and the review paper provides a thorough understanding of the research and development landscape. Though sodium-ion can't compete with lithium in personal electronics because of its lower energy density, it is seen as a viable alternative for large-scale storage where the size of the battery is less of an issue. "Commercial full-cell design includes optimising capacity balancing between the cathode and the anode, finding a stable electrolyte solution, choosing appropriate additives and binders, selecting a separator, as well as the production costs of the active materials for the electrodes and the overall manufacturing cost of the batteries," Dr. Luo said. "This is not always a straightforward process, as many of these parameters are interdependent, so there is a significant amount of trial-and-error in selecting the best combination of design parameters. "Our review paper shows the depth of research showing optimisation of a single component or material, but also the lack of research bringing all the parts together in concert." In the review paper, the researchers identify key indicators for commercial feasibility, including stability to air and moisture contact, the cost of materials and fabrication, electrochemical performance, cycle life, anode and cathode compatibility and environmental friendliness. "To a large extent, how the cycling performance, or battery lifespan, satisfies the requirements of large energy storage systems will determine its commercialisation progress," Dr. Luo said. "For large-scale storage, we need to develop batteries that provide a long life-span to justify the investment." Not bad. On par with consumer grade li-ion batteries. This is a very exciting period of battery research, and I think we can expect major improvements in the years ahead. Importantly, however, companies like Tesla have pressed ahead with "good enough" technology which is creating the excitement we see today for electric vehicles. All good and keep the reporting coming!